Sussex Police say the man rang the doorbell of the rear entrance of One Stop in Winston Crescent at around 6.30am on Saturday (April 13). His face was covered and he was wearing a hi-vis vest over a blue jacket, police said. When a staff member opened the door, police said the man entered reportedly holding a kitchen knife, pushed her into the office and demanded money from the safe. He made off with £147.63 cash. The woman, in her early 50s, was shaken but unhurt, said police. 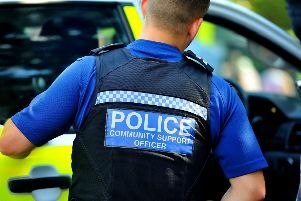 Detective Constable Sean Stapley said, “The suspect is believed to have run past the nearby café towards Seaside, in the direction of the town centre, and then along a path which leads alongside a river towards the rear of Tollgate School.